With the addition of Baader's new Finetuning Rings, each Hyperion eyepiece can now function as four eyepieces! Available in 14mm and 28mm lengths. The finetuning rings are 2" OD and threaded M48 (filter thread) on each end, so they can be installed in-between the Hyperion's removable front negative element and main body. The added spacing decreases the focal lengths (increases magnification), according to the table below. Finetuning rings are made to match the Hyperion finish, and are fully internally sharp v-threaded and blackened to eliminate stray light reflections from the internal surfaces. Also, another novel way to change eyepiece focal length is to use a Baader 2" filter in-between the Hyperion negative element and main body, just like a small finetuning ring. The 8.5mm thickness of the filter cell will have a similar (milder) effect in reducing the Hyperion's focal length. This also allows use of 2" filters with Hyperions, something that is not possible with any other 1.25" eyepiece. Please Note: Removal and installation of the front negative element should be done in a clean environment to prevent dust or other contamination from depositing on the internal elements (which are very difficult to clean). Also, please note that the 24mm Hyperion is not able to make use of the Finetuning Rings, due to its different optical design. The new 10mm Hyperion eyepiece will also benefit from the use of these rings. While there are no official numbers from Baader, we estimate that the 10mm will function approximately as a 7.9mm eyepiece with the 14mm ring, a 6.7mm eyepiece with the 28mm ring, and a 5.8mm eyepiece with the 14+28mm rings. 5.0 (Based on 26 Reviews) 92% of reviewers recommended this product. The use of this ring was suggested to me to add additional depth to my 2" filters. It does an excellent job on this. Allows me to use my 2"/1.25" adapter with a filter attached and a barlow on my eyepiece. Agena was great as well. I had a question about how to store the new filter/ring combination and had my question answered quickly. The Baader Finetuning Ring gives you a whole additional eyepiece at a very small cost. Your eyepiece works like a higher magniffication eyepiece with no negative effects. The ring does make your eyepiece longer, if that's a concern. Having options in a product is best when they make sense and work. Being able to go between 1.25 and 2” barrels is option. Changing the focal length to increase magnification is another option. Now for a clear sky to view. Only AFTER I bought a lot of the Hyperion eyepieces did I discover that I only needed the 17mm and the 8mm to cover almost all the powers available to my SCT 8 when I got the 14 and the 24 spacers. Everyting from 22mm to 4mm is covered. These are finely machined like all Baader products. Go to Baader for their overview PDF and figure out how to cover your scope's range and then sell off your extra eyepieces and go buy more stuff! It works well and allows a change of focal length for the eyepiece. Numerous combinations in conjunction with the 14mm FTR. This product allows to you change the magnification on certain Baader eye pieces. It works as advertised, though it is somewhat difficult to change the rings in the darkness of night while viewing. It is much easier to set up the eyepieces ahead of time. Review by Beginner of Orange, CA. 5.0 Must have for Baader Hyperion eyepiece. These are an inexpensive site way to provide magnification without the need for a Barlow or new lense they are cheap and screw into the eyepiece. The eyepieces are not exactly cheap but good quality for a reasonable price, especially since you do not need to purchase as many. I use this ring to enable 2" filter use with all my eyepieces. I screw it on to the back of my 1.25" adapter and it gives plenty of clearance between all of my 1.25" eyepieces and whatever 2" filter I am using. Review by Dustyhills of Washington, UT. I use them on a 17mm Baader Hyperion. With these rings you don't have to spent hundreds of dollars on other eyepiece focal lengths. With a set of 14mm and 28mm rings your eyepiece is the same as having four different eyepieces. Add a barlow and ......... This is amazing! Review by Newt of Northern MN. 5.0 One ring to rule them all! I have the Hyperion 13mm and bought both the 14 and 28mm rings at the same time; this is a great modular component the the Hyperion line, allowing me to zoom in with my EP down to 8mm. Living in Northern Minnesota, Ive used the rings in temps of -10F or lower and have no problems with manipulating the parts using my Lybar chair as a table. I have read some negative opinions on the Baader system, but it seems very versatile and the flexibilty, quality and great views wins me over. Review by NealC of Clayton, NC. For the price of a couple these, you turn one Hyperion eyepiece into a set. It can be a bit difficult to change rings in the dark. And a stopring is needed if using with 2" diagonals. Review by Ozman of Hopkinsville, KY.
Works perfectly, machined to a super smooth fit. Very light weight so it doesn't increase the weight of the eyepiece. Simple to change the focal length of your premium eyepiece and stays crisp to the edge. If you are lucky enough to own a Hyperion,you absolutely must have these fine tuning rings. Review by Fernando Lopes. of Brazil, PR, Curitiba. It adds great value on Baader Hyperion Eyepieces and improve performance on Baader Multi Purpose Coma Corrector. My set of three Hyperion 5mm, 13mm and 21mm with it now are equalent to a set of twelve eyepieces. And almost three more if I unscrews the lower eyepiece barrel. It is my second set of Hyperion Finetuning rings. I can quickly tuning the focal lenght and the exit pupil, depending of on the night conditions. Review by Dark_Falconer of Monroe, GA. Very Solid. What else can be said, an additional eyepiece with a Finetuning-Ring purchase! Review by Rangel of Guayas, Ecuador. Review by Filipe of Curitiba, Brazil. These rings change the focal length as an extension tube. Lightweight, easy to use and cost much less than a quality barlow. They form a great combination with the Baader Hyperion. Review by Captain Ron of West Michigan. Great product, easy to understand and use. Review by Dave of Tenino, WA. When using these fine tuning rings each eyepiece is capable of 5 diferent focal lengths. 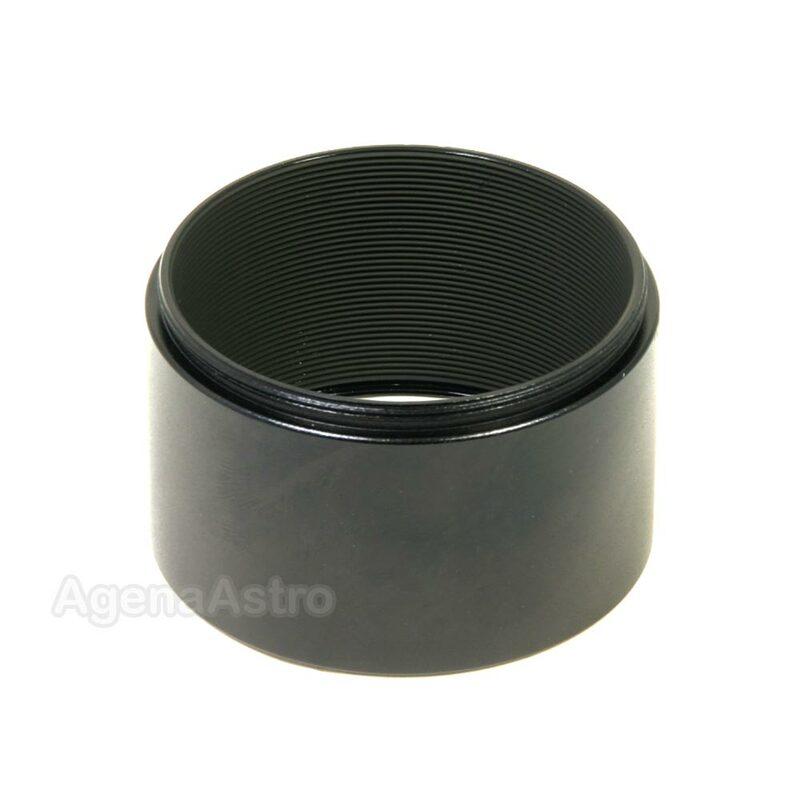 Agena Astro Products is a quality on line store with fair price. I will buy from them again. Review by Jesiel of Rio de Janeiro - Brazil. 5.0 Good quality and good price! I loved this rings. Are perfect! Review by pvaz of Portugal. I needed this to be able to use 2" filters on my Ethos 10mm. It does what it's supposed to do and it's much cheaper then the equivalent TV barrel extender. Review by Texdawg of El Paso, TX. They are very useful for all 2" application for use with my 2" Barlow and 2" filters. Gives me powers other than 2x with my Barlow. Needed this to go with my Hyperions. I like Baader products for their quality. These thing work so well, so easy to use. The threading is so well machined, makes swapping them in and out of my Hyperion lens so easy. Truly money well spent. Its like getting a whole new lens for less than [$]. Combine that with a Barlow and it gets even better. For Hyperion owners out there these should be in your collection ASAP! I highly recommend getting both fine tuning rings as well. The mag possibilities you can get from just one lens and these rings is truly awesome. With a Barlow...staggering...SO COOL!! The Hyperion fine tuning rings offer untold pleasures for equipment tweakers and seeing connoisseurs alike. Being able to gain that bit of extra flexibility from your Hyperion eyepiece will allow you to frame your field of view just how you like it without any loss in image. These rings should be purchased as default with the Hyperions. Review by Viju Joshi of Orlando, FL. This is a great product from Baader. It litrally eliminates the need for barlow.Price was right.